I don’t talk that much about having survived breast cancer twice. Each time I was thrown into the cancer arena was shocking and it was immediately transforming, and not always the joyous, fun sort of transformation. Indeed, it is true that life can and does change in an instant. Another reason I am grateful for my consistent, daily meditation practice. Meditation reminds me to stay with what IS, and to do that with as little judgement as possible. After the second round of cancer, which included having my right breast cut off, I stopped being friends with the mirror. In fact, for more than two years I avoided mirrors like the plague. In short, I HATED seeing my body. I stop short of saying that I hated my body, but it was darn close to hatred. That nine inch scar across my chest was a shock every time I inadvertently saw it. The scar seemed to mock me. Telling me that I wasn’t really a woman anymore, since I was missing a key female part of my body. 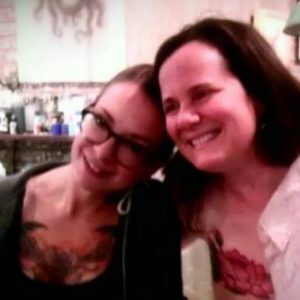 When I got the message from my t1 diabetes pal Sarah Lems that her neighbor had started an organization for women who had mastectomies to get tattoos over their scars, I was immediately captivated. I reached out to Noel Franus who created Personal Ink, P.ink. Instantly I was one of the 10 women who got to fly to New York City to get a tattoo. That tattoo FOREVER changed my life. A change of the beautiful, joyous, life-inspiring variety! 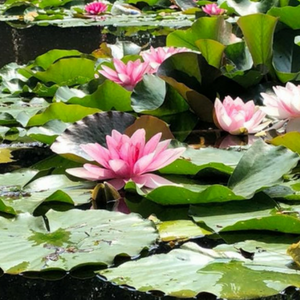 Lotus pond photo taken by my friend Christin last week! Now when I see my chest in the mirror, I smile. I remember that despite all the darkness I have endured, I am full of light. I remember the gifts I have to give and all that I have received. That bit of ink on my body has positively impacted me. The other gift of P.ink is the community of incredible women I have met. I got my tattoo in October of 2013. The next year, Noel asked me if I would be a Local Leader and organize a P.ink Tattoo Day here in Minneapolis. I said yes and ever since I’ve been involved. I’ve met and worked with INCREDIBLE survivor warrior women every year! This year, I’m working closely with Deb Kuhns and Michelle Banks. Two fellow survivor warriors who have agreed to co-lead the event for 2018. Michelle, a P.ink Day MSP co-leader! This year, we will have three tattoo shops participate, with between 13 and 15 tattoo artists donating their skill to this healing event. That means that between 13 and 15 women will get tattoos over their mastectomy scars. The past few days I’ve been talking to the women, interviewing them to confirm that they are ready for such an amazing tattoo. After almost every phone call, I set down my phone and experience tears and joy, all rolled up in one. The healing action of getting a beautiful tattoo in a community of supportive artists and fellow survivor warriors transforms the loss of ones sense of femininity in incredible ways. All of the 29 women who have so far gotten tattoos as part of P.ink Tattoo Day Minneapolis-St. Paul are to this day happy with their healing art transformation. This is a community I am profoundly grateful to be a member of. Thanks for reading and for being a part of my world! I don’t know what to say. Seriously. This is so fantastic!! So thrilled for the lucky 13-15 recipients. Didn’t get a call this year, was really anticipating weaving my tattoo experience into my book, Warrior Princesses Don’t Wear Bikinis, due out early 2019. Maybe next time!! Great to hear from you! You are applicant #13 on our application! That means that Michelle is going to be calling you!!! She’s working on her outreach!! So cool that you’ve got a book coming out! Exciting!